In the world of color psychology, my high school friend Jessica, is most certainly red – the personality color characterized by strong will, ambition and energy. Along with a hilarious sense of humor and a penchant for movie quotes, these are all traits that I’ve always known to describe Jessica. A successful business woman armed with a law degree, she is now the owner of multiple Pure Barre fitness studios – a franchise easily recognized by its – you guessed it – bright red logo. Jessica, at her bridal shower, opening the custom Pure Barre Converse I made for her. 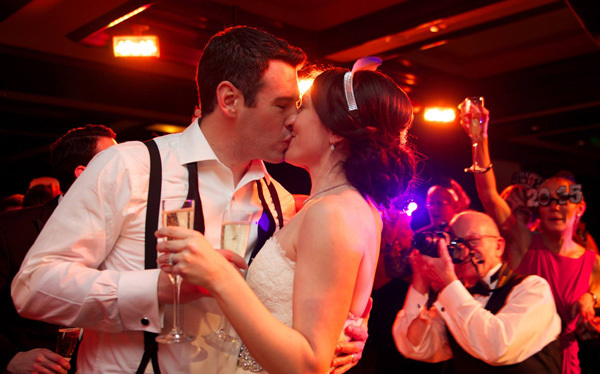 People with red personality are also quite competitive and are not willing to settle for second best, so it came as no surprised that Jessica was planning a New Years Eve wedding at one of Boston’s top venues, The Boston Harbor Hotel. 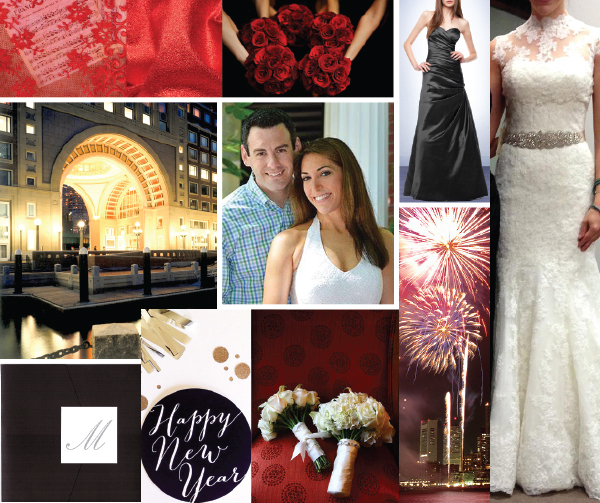 My challenge in designing her custom wedding shoes was to make a bold statement while still maintaining the classic elegance that her lace dress and formal surroundings demanded. Luckily, after reviewing the list of details in her information packet, there was a lot to be inspired by. While Jess wasn’t so confident about my idea of using fiber optics to represent the New Years fireworks (a concept I later used on a pair for myself! 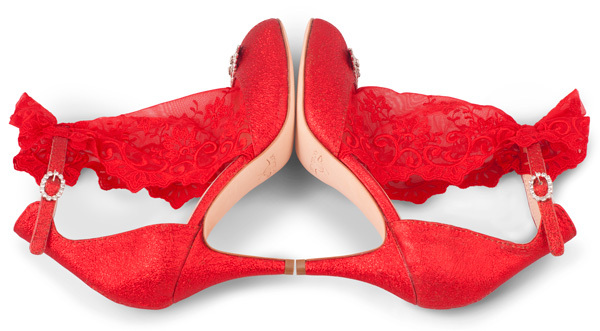 ), she was totally on board with wearing a bright red wedding shoe. 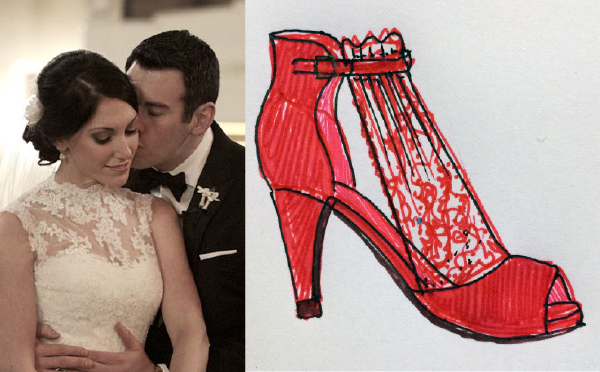 Her dress featured a unique removable high-neck lace bolero and so I designed the shoe to have a similar high neckline of shear lace (see below, along with my initial sketch). For this I sourced some exquisite red French trim from Quebec that matched perfectly with the metallic red Italian lambskin that would be used on the rest of the shoe. An art deco crystal brooch positioned over the toe coordinated with Jessica’s rhinestone belt for the finishing touch. The description found on psychologia.co for the color red personality also explains that, “People with red personality type are usually quite active, cheerful and optimistic,” and that “Many people want to be around them in hopes that their joy and happiness will rub off on them too.” This is undoubtedly the case with my friend Jessica, whether through her warm welcome to anyone coming into her studio to the radiant charisma she exuded all throughout her wedding. That night, the red shoes were a symbol of her strong presence that will surely lead to a lifetime of continued success, both in business and her hew marriage. Miller Studio Photo. See more of Jessica’s wedding shoes on her page of our Gallery! This entry was posted in gallery preview, inspiration, shoes. Bookmark the permalink.